One stalk of sweet corn typically only produces one ear of corn and is only picked once a season. This means at Pickering Hill Farms, in order to pick corn fresh every day, we have to plant every 4 days for more than 3 months (early April to mid-July). 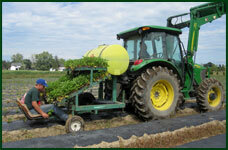 All of Pickering Hill Farms produce is hand picked. Red sweet peppers are green peppers left to ripen on the plant. A red pepper is really just a ripe green pepper. 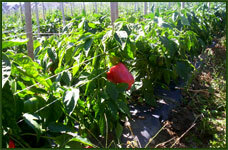 In order to allow green peppers to turn red we must leave them in the field longer. At least half of all peppers left to turn red will rot or be harmed before they are ready to be picked. For this reason red peppers often cost more than green. Pickering Hill Farms employs “green growing practices” such as trickle irrigation and black plastic mulch to conserve our natural resources and reduce pesticide usage. All of our strawberries, tomatoes, peppers, squash, beans and eggplant are grown on raised beds (to increase ground temperature) covered by black plastic (eliminating the need for herbicides) and irrigated with drip (trickle) irrigation (reducing water consumption). 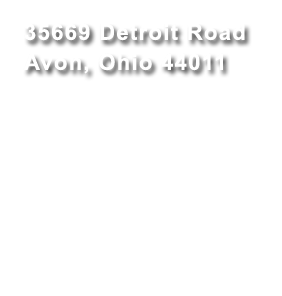 Pickering Hill Farms was one of the first in northern Ohio, nearly 15 years ago, to use this process. Every year Jay evaluates and experiments with new growing practices to make our farm more efficient and reduce our environmental footprint. Most of the corn you might see growing in fields as you drive around is field corn not sweet corn. Sweet corn is a cousin to field corn. 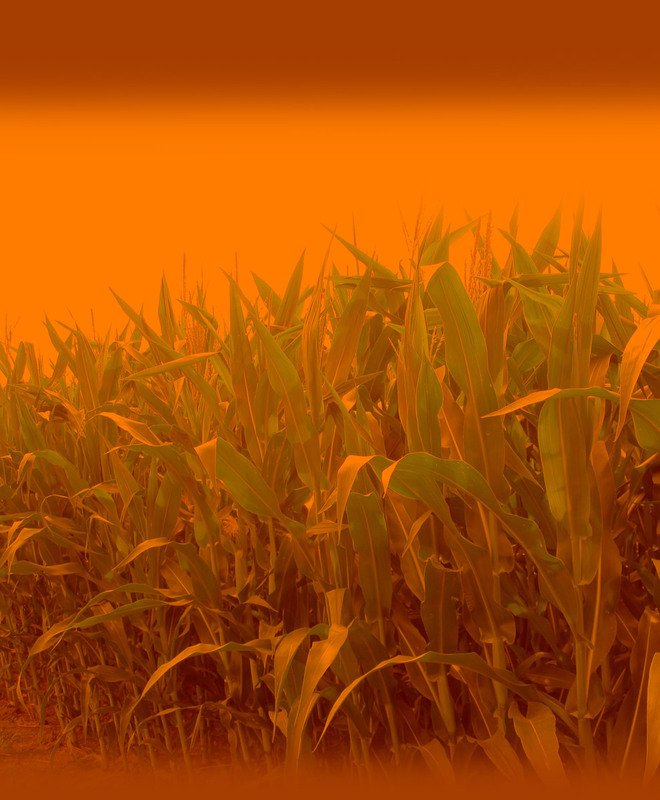 Field corn is very hardy and is grown to produce dry, starchy kernel used for cattle feed, corn syrup (used in soda pop), corn meal, corn flakes, tacos and thousands of other things. Sweet corn is less hardy and is harvested with soft young kernels to be eaten fresh. Sweet corn kernels contain more sugar initially, but if not eaten fresh or picked at the correct time that sugar will convert to starch. Not all sweet corn is the same, there are hundreds, if not thousands of varieties of sweet corn. 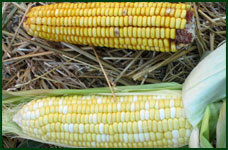 Sweet corn has three kernel color types: yellow, white and bicolor (both yellow and white kernels). Generally, people believe that a particular color type is sweeter, but sweetness genes mostly determine the level of sweetness. About 30 years ago researchers discovered the sweetest sweet corns contained genes that increased sugar levels. These genes were called sweet genes and later varieties containing them were referred to as super sweet varieties, the only varieties Pickering Hill Farms raises.